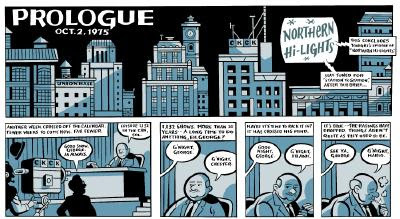 I'm a big fan of Seth, and currently you can read a comic of his, called George Sprott on the New York Times website. It's basically the life story of an old-timey TV show host, although it doensn't really explain much about the man himself by the very end. There are a series of interviews drawn by people who knew Sprott, or were fans of him. It's presented in 21 chapters, in PDF form. It looks a lot like Wimbledon Green, if you've had the pleasure of reading that. Be sure to check it out soon, who knows how long it will be online. Last year, this page was the site of Chris Ware's Building Stories, and that has long since disappeared.